Digging through notes I made during my research in the Lick Observatory archives in 2013, I found an intriguing letter written by Thomas Fraser, the foreman during the construction of the observatory, addressed to Richard Floyd, the chairman of the Lick Trust. Fraser wrote it while traveling in the spring and early summer of 1885, when he represented the observatory’s interests before various dignitaries and astronomers and studied extant dome designs in various eastern U.S. cities. 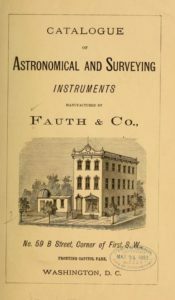 Title page of Fauth & Co. catalogue, 1883, full text available at archive.org. From Virginia, Fraser traveled to Boston via New York, where he tried but apparently failed to meet with Henry Draper. In the Boston area, Fraser first visited Alvan Clark’s workshop in Cambridgeport, MA (about 2-1/2 miles from where I’m sitting; the Central Square Branch of the Cambridge Public Library now sits on that site) to look at the 30-inch refractor Clark was building for Pulkovo Observatory. He then visited Charles Pickering at the Harvard College Observatory. 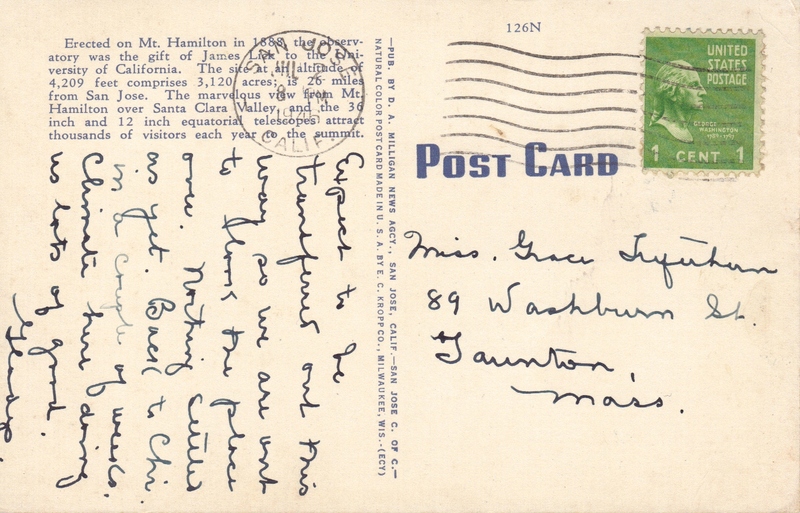 Fraser was busy in Boston (but not too busy to take a vacation in Lisbon, Maine, with his wife), wooing potential donors (James Francis up in Lowell), trying to sort out (by letter) issues with the lenses being constructed by Charles Feil in Paris, and so on. It took him awhile to move on. When he did, he stopped in New York and New Jersey to look at Princeton’s dome before heading to the United States Military Academy at West Point, NY, to study the dome at that school’s new observatory. What was special about this dome? It was made of paper. 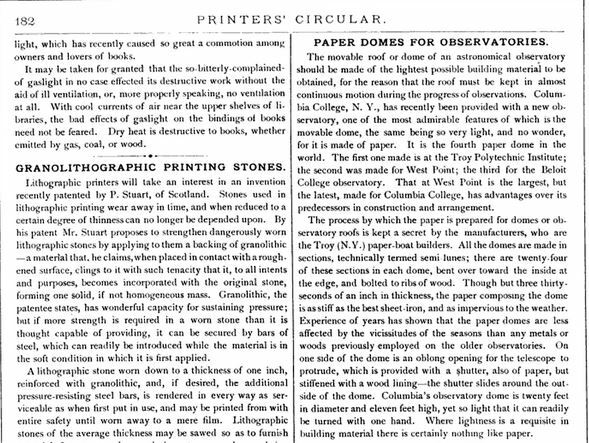 West Point was only one of several U.S. observatories with paper domes at the end of the 19th century. I can see the allure of paper as a building material, at least in theory. It was lightweight, for one, and if you’ve ever played with papier-mâché, you’ll have some idea as to how it would work in a mold. It’s durability was already being tested in other areas of construction. Paper boats really were a thing back then, specifically, boats made by George and Elisha Waters (E. Waters & Sons) in upstate New York. It doesn’t seem like too much of a creative leap, anyway, to think about paper if you’re searching for a thin, durable, dome skin. The Annual Report of the Commissioner of Patents for 1881 indicates that E., C.W., and G.A. Waters filed a patent for paper domes on May 3rd. But were paper domes any good, or did Fraser find they, too, had “many bad points”? Patent brief from Official Gazette of the United States Patent Office, 1881. 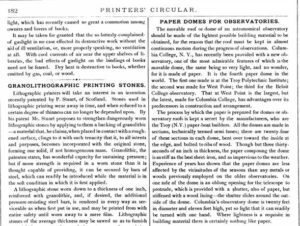 “Paper Domes for Observatories,” The Printers’ Circular and Stationers’ and Publishers’ Gazette Vol. 18, 1883. 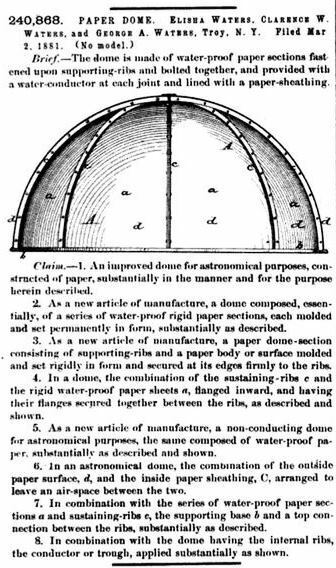 The first paper dome manufactured by E. Waters & Sons went to the Williams Proudfit Observatory at Rensselaer Polytechnic Institute in the Waters’ hometown of Troy, NY. Although the manufacturing process was kept a trade secret, the basics were reported fairly widely. The dome hemisphere was divided into sections and built out of molded wood ribs. The ribs were covered with linen paper molded to the right shape and treated with a (secret formula) resin. 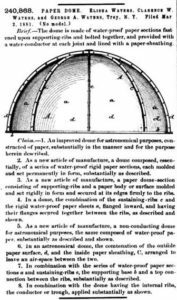 The individual wood-and-paper sections were then bolted together to form the dome. Allegedly RPI’s dome, which rotated on oversized ball-bearings on an iron track, worked just fine. 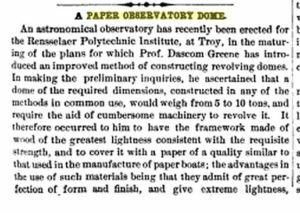 Part 1, “Paper Observatory Dome,” from Scientific American, February 22, 1879. 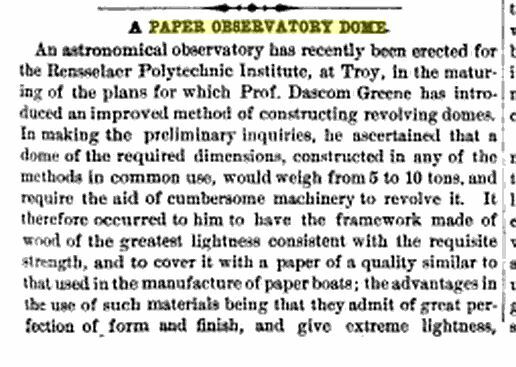 Part 2, “Paper Observatory Dome,” from Scientific American, February 22, 1879. 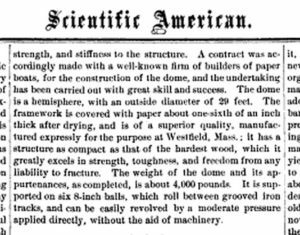 Given its proximity to RPI, it’s not surprising that the United States Military Academy (West Point) also ended up with a paper dome at its new observatory. West Point’s original observatory was part of the “old” Cadet Library, built in 1841. Vol. 9, No. 2 (1845), pp. 191-203. 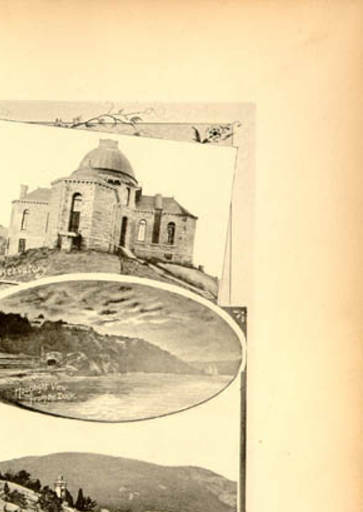 This library observatory was described well in “Observatories of the United States,” published in Harper’s New Monthly Magazine for March 1874 (West Point is covered on pages 539-541). 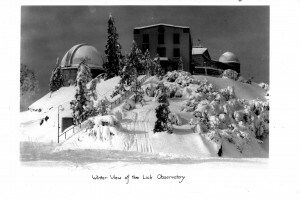 The same article announced that the observatory was in peril, for the West Shore Railroad Company had purchased the right of way to build a tunnel directly beneath the observatory property, necessitating the moving of equipment (the 12-inch Clark refractor, specifically) to a new site. The new site turned out to be a knoll on the east shore of Lusk Reservoir. Landscape program proposed by Olmsted Brothers, from Sylvester Baxter, “The New West Point,” Century Illustrated Monthly Vol. 69, no. 3 (July 1904), p. 338. 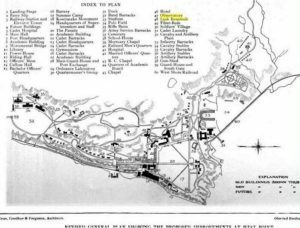 I’m surprised how little has been written about the “new” West Point observatory, particularly since Holden ended up there as a librarian — or maybe that’s the reason. After Holden’s acrimonious departure from Lick in 1897, he more or less abandoned astronomy, taking up a librarian position at West Point in 1901. Or possibly it’s because the heavy-lifting was done by the U.S. Naval Observatory, not at West Point. 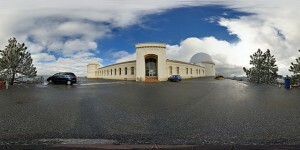 At any rate, images of the observatory are difficult to find. 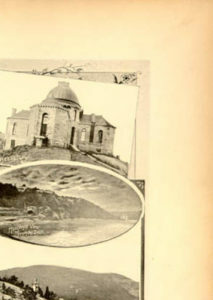 A report on the observatory published in the Publications of the Astronomical Society of the Pacific in 1891 describes the instruments, but not the building. 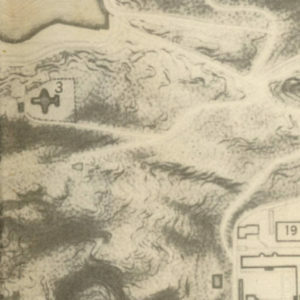 I found a campus map in the West Point archives that shows a cruciform floor plan, as well a photo-engraving that shows the exterior of the building. Observatory footprint (3) from West Point yearbook, the Howitzer. Image: West Point Archives, U410.N5.H84 1946. 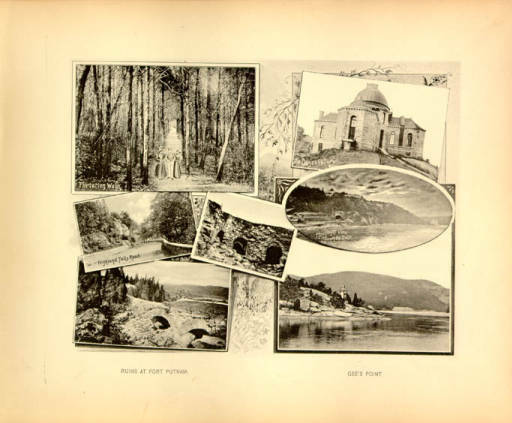 From Aldolph Whitman, U.S. Military Academy, West Point, N.Y.: photo-gravures, 1896. Archives identifier U410.L3 W783 1896. Detail from Aldolph Whitman, U.S. Military Academy, West Point, N.Y.: photo-gravures, 1896. Image: West Point Archives, U410.L3 W783 1896. Ouch. Fraser expected better of the West Point boys, and judging from his evaluation, I would’ve expected the dome to fail a week or two later. Of course, it didn’t, and we know Fraser was a bit … hard to please … when it came to domes, so it probably wasn’t the disaster he described. Although the dome was repaired at one point in its long life, it was never replaced. 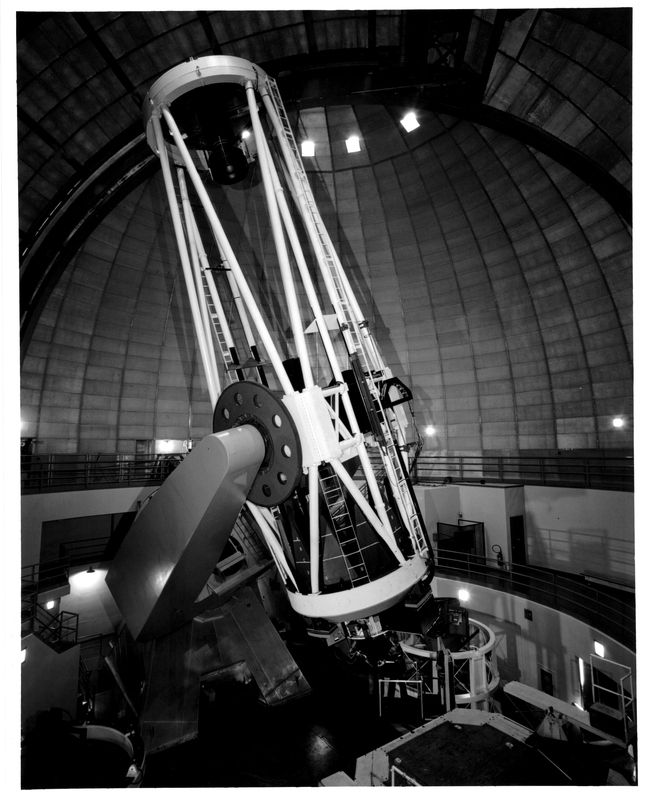 According to Jim Chung (Astro-Imaging Projects for Amateur Astronomers: A Maker’s Guide, Springer 2002), the observatory and refractor were restored in 1938 by a sophomore cadet named Alan Edward Gee, but after Gee graduated, no one used the observatory. 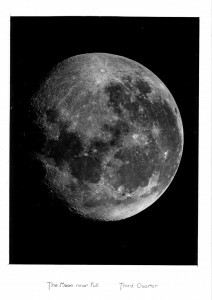 I dug deep into the S&T archives and found a mention of a visit to the West Point Observatory made by members of the Amateur Astronomers League of America (A.A.A.) in May 1941 (“Notes on the A.A.V.S.O. Spring Meeting,” The Sky Vol. V, No. 9 (July 1941): 16). 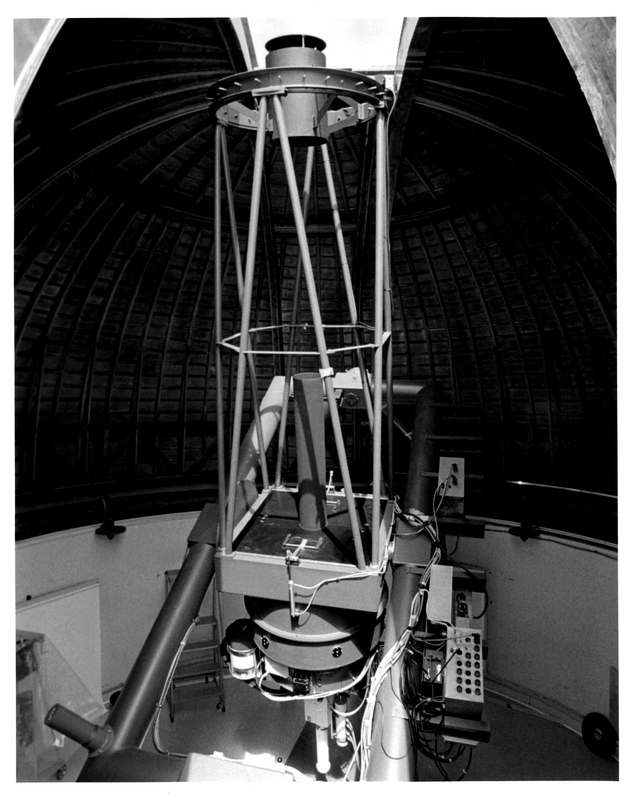 The group operated the “fine 12-inch refractor which is unfortunately not used at the present time” during their visit, as well as the dome, though no one described the dome in print. The author of an article on paper canoes in the February 1951 issue of Popular Science claimed that the West Point dome was “still good as new.” However, a 2004 historic structures report on the redoubts of West Point noted that the observatory was demolished in the 1950s, so it seems unlikely that the dome was in pristine condition at that late a date. At least two other college observatories sported paper domes: Beloit College and Columbia. 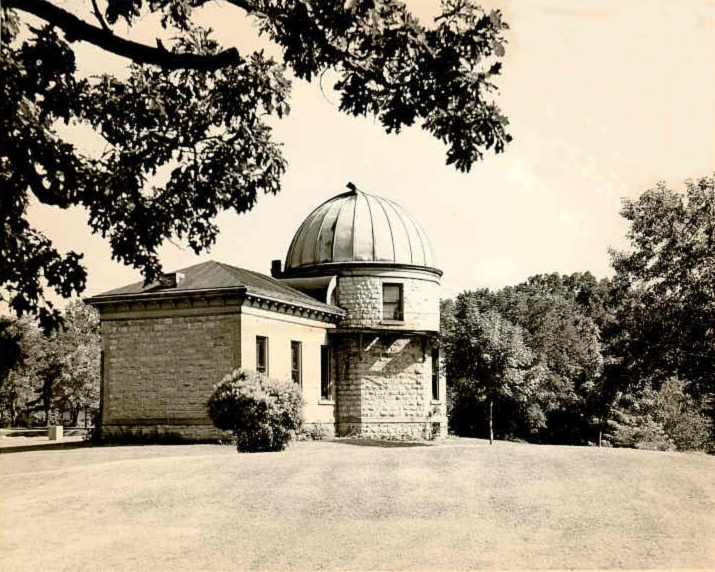 Beloit’s Smith Observatory welcomed its paper dome on September 6, 1882. The dome apparently stood until the observatory building was demolished in 1969. 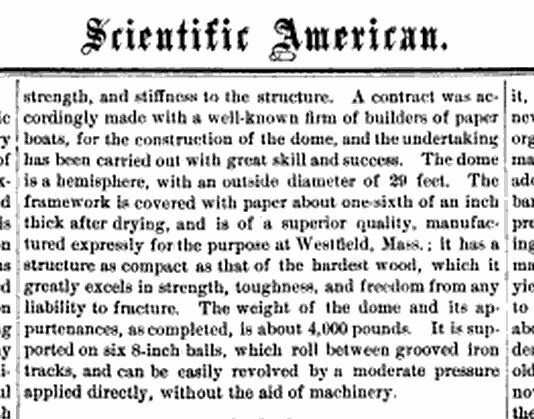 The dome for the new observatory at Columbia (then College, now University) necessarily needed to be lightweight. The observatory was built on top of the college library, 110 feet above grade, on iron girders “entirely independent of the floor.” According to the Printers’ Circular reproduced above, Columbia’s dome was 20 feet in diameter and 11 feet tall, “yet so light that it [could] readily be turned with one hand.” That would certainly be handy. 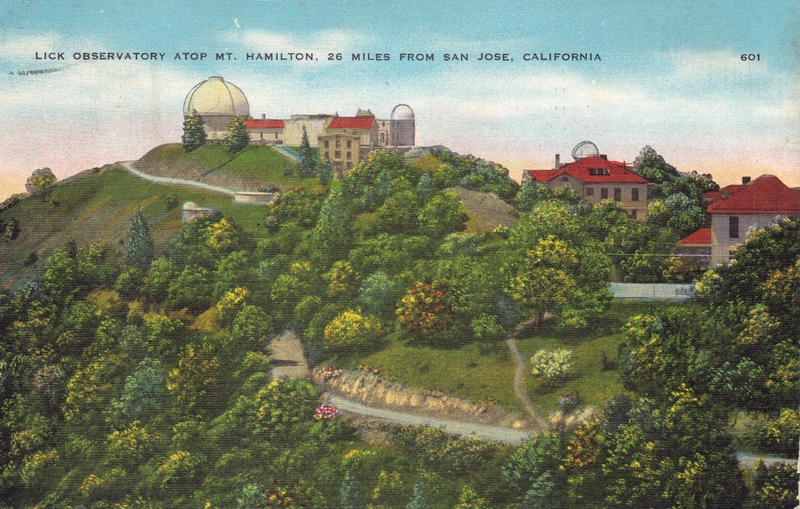 But a historical sketch of Columbia, written in 1893, noted that “the position of the observatory in the middle of a city block close by one of hte largest railroads in the country, and surrounded by smoky chimneys and brilliant electric lights, makes it a poor place generally for observation.” Plans were already in the works for a new observatory at 116th Street. So the longevity of the paper dome was probably the least of the university’s worries. Did the paper dome “craze” last? Not in a professional context. Certainly it wasn’t practical for the large-scale domes like the one at Lick (interested parties can send me their calculations for live loads on a paper observatory roof — could it hold the snow?). 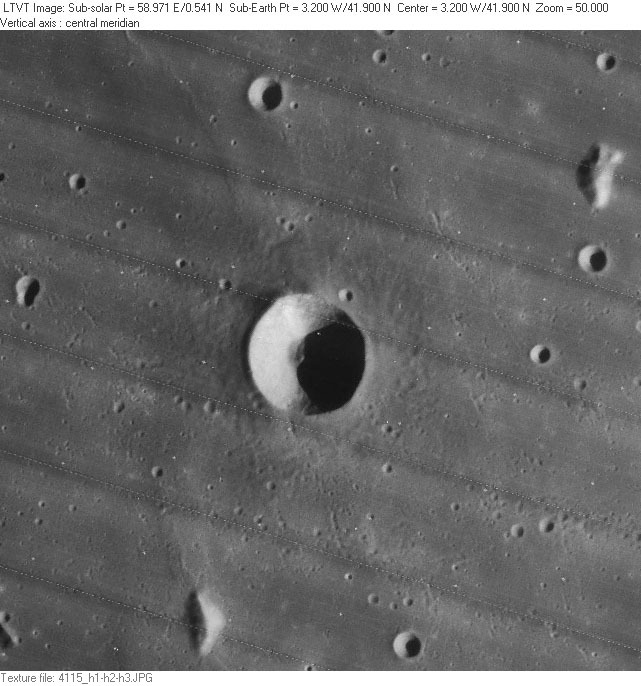 But I recently came across this thread on Cloudy Nights, and it seems the paper dome still has a place in amateur astronomy. Taruntius Crater (with Cameron Crater). 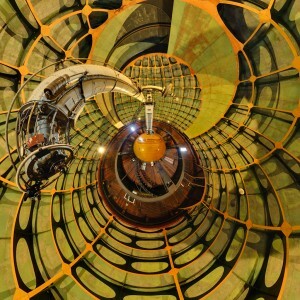 Image courtesy LPOD, December 3, 2008. I wish I knew if this was a cautionary tale or a story of triumph. Robert Curry Cameron, known to his friends and professors as Bob, matriculated at Indiana University in 1947. Circumstantial evidence suggests that he came from Ohio. His formal name seems to tie him to the Curry family from Wayne County, Ohio (the lumber firm Curry, Cameron & Son, comprised of James Willard Curry and Robert Cameron, formed in 1877); when he left Indiana University, he found work in Cincinnati, Ohio. The astronomy profession of the mid-twentieth-century had at least this in common with the profession of the nineteenth and twenty-first centuries: success was partly about intelligence and dedication, and partly about who you knew. Letters of recommendation were more informal then than they are now, but a statement of support from a powerhouse astronomer could (can) do much to smooth over a bad patch in a student’s career. A less-than-enthusiastic letter could dog a graduate student for life, arriving in the hands of future employers before he (seldom, she) had a chance to speak for himself. Astronomer Frank Edmondson depended heavily on the American academic network when filling positions in the Indiana University Astronomy Department and the associated Link Goethe Observatory in Brooklyn, Indiana. He took seriously the recommendations of his fellow astronomers. He consulted the various Directors off Lick Observatory whenever he had a vacancy to fill, whether it be for a postdoc, instructor, junior faculty, or full professor. He was also diligent in his recommendations to his colleagues, possibly to the detriment of poor Bob Cameron. Robert C. Cameron was a beginning graduate student here during the academic year 1947-48. He did respectable work during the first semester. However, about the middle of the second semester something happened and he simply stopped working. As a result, he failed in some of his courses and made such low marks in the rest that it was equivalent to failure. He is an assistant at the Cincinnati Observatory this year, and Dr. Herget could tell you how he is getting along now. Personality and character are OK, and I think you would find him an acceptable member of a small community such as you have on Mount Hamilton. As for his ability and promise as a student, I hesitate to make any predictions. If he has overcome whatever was troubling him last spring, and if a repetition is unlikely, I would rank him a bit above average in ability and promise as a student. …for the sake of the record I should say that I have talked to Herget recently and there is no reason to believe that Cameron has overcome his personal troubles, whatever they were. Hence, I could not recommend him to you as a student or an assistant. Try as I might, I have not been able to uncover the nature of Cameron’s “personal troubles.” In February 1949, Cameron was listed as a Student Member of the Astronomical Society of the Pacific. He also attended the Annual Meeting of the American Astronomical Society in Bloomington, Indiana in June 1950. He is listed as first or second author on a series of papers related to minor planet observations made at Goethe Link Observatory in 1949 and 1950 and is credited with the discovery of 1575 Winifred (1950 HH), a Main Belt Asteroid, on April 20, 1950 at Brooklyn, Indiana. Did Edmondson let him come back to IU after he proved he was over his “personal troubles”? I’ve failed to track Cameron through the 1950s, but in the 1960s, he reappears as an expert on magnetic fields and stars. He shows up as first author of a paper on Babcocks’ star (HD 215441). From there, he advanced to editorial work on books about stellar evolution and magnetic fields. His last publication seems to have been a 1967 edited volume The Magnetic and Related Stars (Proceedings of a symposium, Greenbelt, Md., Nov. 1965), which received several favorable reviews the next year. 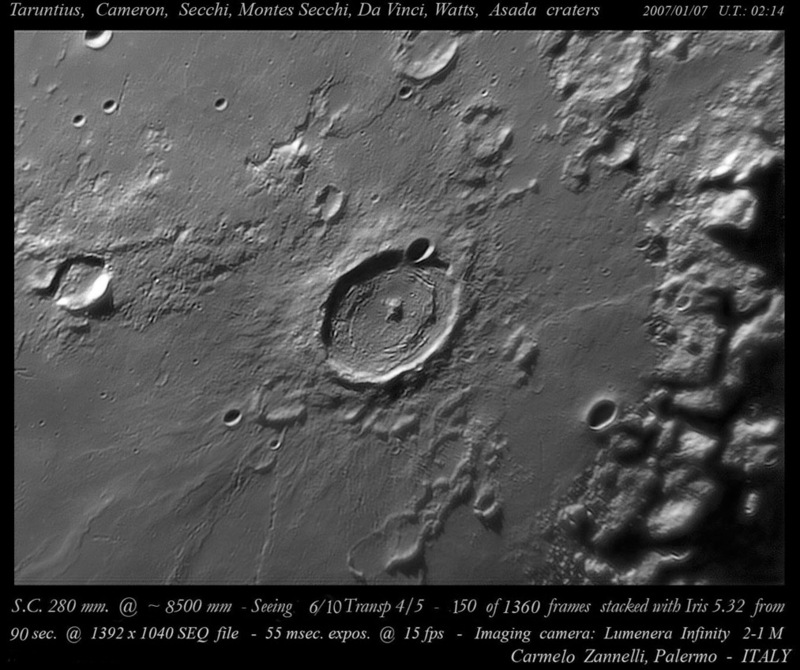 He died in 1972, a successful enough astronomer that the IAU eventually renamed a small lunar crater (Taruntius C) in his honor. I’d like to know: was Cameron satisfied in his career? Did he resolve his “personal troubles” to his own satisfaction? Was the discovery of an asteroid enough to make up for being asked to leave Indiana University? Do students ever recover from bad times if those happen to coincide with their years in graduate school? I’m sure many Ph.D. candidates would like to know the answer to that one. Mary Lea Shane Archives, University of California, Santa Cruz, UA 36 Lick Series 1, Box 83, Letter from Frank K. Edmondson to C. Douglas Shane, 29 January 1949. 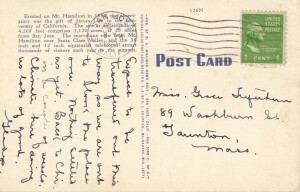 Mary Lea Shane Archives, University of California, Santa Cruz, UA 36 Lick Series 1, Box 83, Letter from Frank K. Edmondson to C. Douglas Shane, 13 March 1949. “Minutes of the Annual Meeting of the Astronomical Society of the Pacific, February 2, 1949,” Publications of the Astronomical Society of the Pacific, Vol. 61, No. 359, p.114. From your noble eagle’s perch and grand employ for intellectual man in scanning the wonders of the Sidereal Universe, how kind of you to make a little leisure wherein to recognise, that after my having, in utter despair, torn up all the stakes and ropes of a life-long employment, — I should highly appreciate a few friendly words from those who understand the subjects I have aimed at, oh! how earnestly, though nearly ineffectually, and partly from want of any sufficient apparatus or necessary means. While from the manner in which you are pleased to allude to my early experiment on the Peak of Teneriffe, — I am now quite ready to let that go by the board even in my own private thoughts, — for if it has had any share in directing a converging attention in America towards thinking and working out ultimately, & I might say inventing, so superb an Institution as the Lick Observatory on Mount Hamilton, with the friendly mists of the Pacific through the summer nights to cut off the radiations of the heated lower country; and with the grandest astronomical instruments yet constructed anywhere, but all of American manufacture—it has helped a little those who have carried out an ideal for above anything I had ever contemplated even proposing. 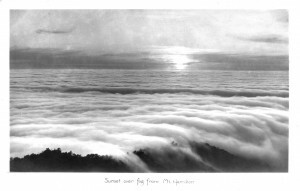 Courtesy, Special Collections, University Library, University of California Santa Cruz. Lick Records, Mary Lea Shane Archives. If all goes as scheduled, by the time this post reaches its intended audience, I will be in the air, flying toward the American west coast. I’ll be spending the balance of the month in central California, working in the Lick Observatory Archives at UC-Santa Cruz. This trip marks the beginning of an entirely new research project for me—new topic, new time period, new theoretical concerns. I’m more excited about this than I have been about anything I’ve worked on to date; I hope that means I’m headed in a good direction. Regardless, I get to spend some time reading original correspondence and papers related to the construction of the observatory in the 1880s. How cool is that? The above panorama of the observatory building was produced by Rick (Ruei ke). Right click to save to your hard drive, or visit Rick’s flickr page to download other sizes and look at his other intriguing images. I’m on the road (again) next week. 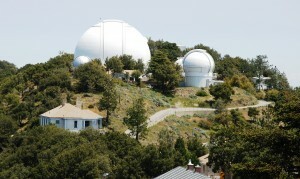 The last time I was in central California, I took a day to visit Lick Observatory. I can’t really count on that option this trip, since the road to Mount Hamilton closes during winter weather. While I was casting around on the Internet for other day trip options, I somehow managed to type both “Lick Observatory” and “Yosemite” in the Google search box. And look what that combination returned to me: a view from Mount Hamilton toward Yosemite Valley with Half Dome clearly visible. Looking the map, it doesn’t seem possible, but in fact, yes, it is. I found two other photographs in the UC Santa Cruz collection showing the same view. 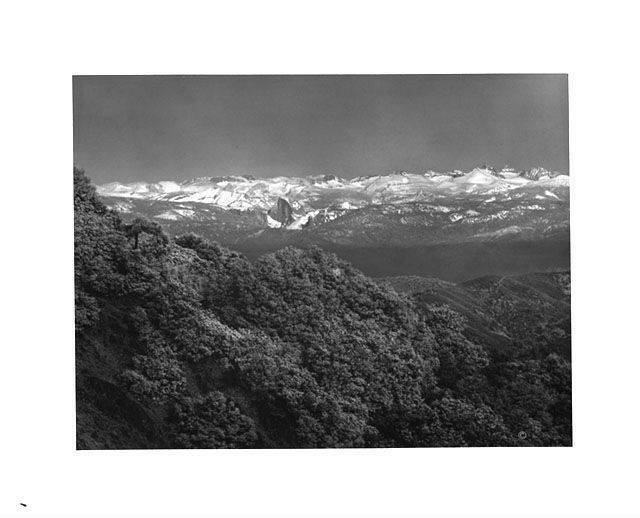 This discovery prompted me to look at my own photos from Lick Observatory, but it’s obvious that I would’ve had to stand on top of Copernicus Peak to see Half Dome. That’s not an option for the average observatory visitor. I wonder: could I use my status as a university faculty member and a historian of astronomy to garner special hiking privileges? I’ll let you know next summer. I’m not sure how the poor air quality in the Central Valley would affect the view. Mount Hamilton rises above the smog pushing against it from the east and the west. Since Half Dome is about 400 feet higher than Copernicus Peak, it should rise above the haze as well, right? Rumor has it that I can see Half Dome from Modesto. I would doubt it, except I’ve seen this photo taken in Patterson, between Modesto and the I-5 corridor, and this stunning photo taken in Turlock, south of Modesto. I’ll do some exploring and report back, even though it’s not directly connected to astronomical observatories. One final set of photos of Lick Observatory: two shots of weather (note the scraping of the image of the sunset); one facade (nice car); one landscape (compare it with the postcard I posted a few days ago); and one gorgeous black-and-white of the moon. As always, click on the image for high res. Lick Observatory, Mt. Hamilton, California. 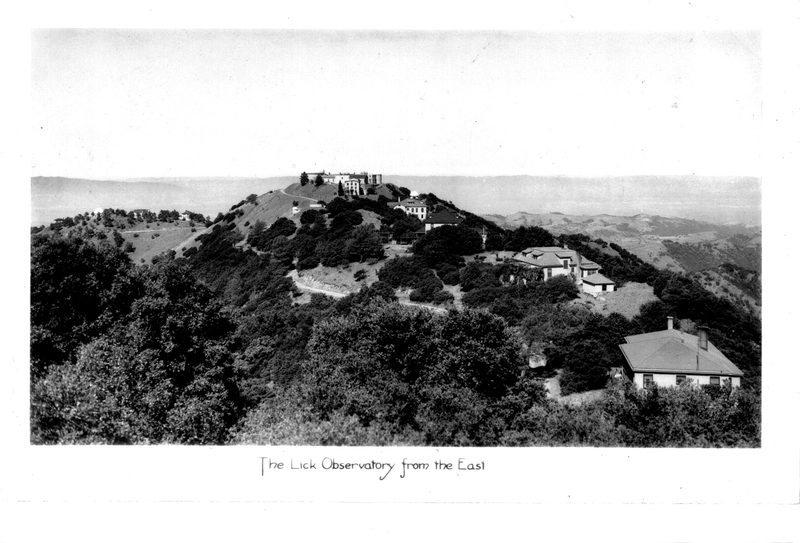 Back of postcard, Lick Observatory. Great Lick 36" Refractor Telescope. Copyright: UC Regents. Anna Nickel 40" Telescope. Copyright: UC Regents. 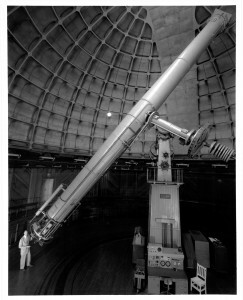 Shane 120" Telescope. Copyright: UC Regents. 36" Lick Refractor. Photo Credit: JR.
Life unexpectedly detoured me through central California last week, so I thought I would take advantage of its (relative) proximity to visit Lick Observatory. The observatory is draped across the uppermost peaks of Mt. Hamilton in the Diablo Range east of San Jose. It’s open to the public on most days of the year, but hours and days are restricted during the winter months, so check the opening schedule before making the drive. 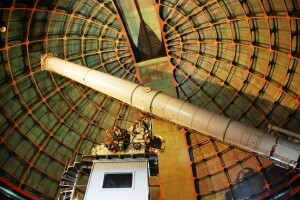 The daytime public program is focused on the historic instruments of the observatory, especially the Great Refractor installed under the dome custom-built for it in 1887. This 36″ telescope, the lenses for which were ground by Alvan Clark & Son (the same workshop that ground the lenses for the refractors at the Yerkes and Cincinnati observatories), lives in the largest of two domes flanking the Main Building of the observatory. A 12″ reflector that had been purchased second-hand from Alvan Clark originally lived in the smaller dome at the opposite end of the building; it now houses the 40″ Nickel Reflector. One has to wonder what instrumental astronomy would have looked like in the U.S. at the end of the nineteenth century had Alvan Clark not been around to polish the needed lenses and mirrors. Interior of Great Refractor Dome, Lick Observatory. Photo credit: JR.
As you can see from the photo above, the Great Refractor was protected by a dome that was designed with a concern for aesthetics as much as functionality. The underside of the dome was tinted with a color meant to evoke the heavens and the walls were finished with California redwood paneling. James Lick might’ve been an odd guy, but he knew his woodworking. 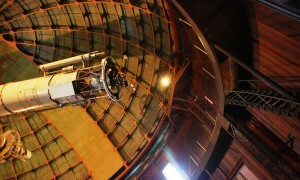 Observing floor and vertical gear, Lick Observatory. Photo credit: JR. 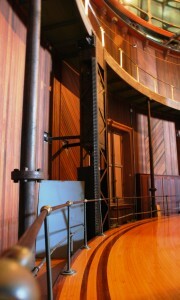 The floor of the observatory, which was finished with mahogany and ringed with brass railings, was designed to move up and down along a vertical system of spur gears. 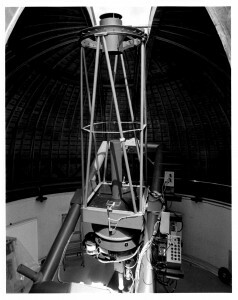 This cleverness allowed observers to stand on a solid surface while looking through the eyepiece of the telescope, rather than on top of a ladder as was customary with large instruments. Looking East to Shane 3-meter Reflector, Lick Observatory. Photo credit: JR. In addition to the guide-led program in the Main Building, there is also a small viewing gallery open to the public in the dome of the Shane 3-meter Reflector. I thought the gallery was under-used, in that the interpretive materials were limited, and public view of the instrument was partially blocked by unidentified objects. The most interesting part of the display was the absolutely ancient black-and-white publicity movie that talked about the early history of the instrument. The corners on Mt. Hamilton Road are so tight that they had to use a relay system to get the 120″ glass for the mirror to its destination, using a crane to transfer the glass from the bed of the truck approaching the corner to the truck waiting on the other side of the corner. You can see below that many of the corners are more than just simple switchbacks, they actually start to double-back on themselves. 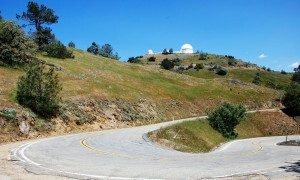 Approach to Lick Observatory, Mt. Hamilton Road. Photo credit: JR.
As an architectural historian, I thought the public program was fascinating; I stood through it twice, in fact. As I was wandering around the larger complex, however, I couldn’t help but wish that public programs spent more time explicating current research and observing practices. I suppose it’s not very practical to demonstrate the Automated Planet Finder or the Katzman Automatic Imaging Telescope; most observational data is crunched with computers manned by tired postdocs. (Take a look at a panoramic view of the control room for the Shane 3-meter during an observing run, for instance. Not enough drama for tourists, I’m pretty sure.) But sometimes I wonder if programs focused on the historical leave the public with the feeling that little has changed in instrumental astronomy in the last century, or if it has, that those changes aren’t important or comprehensible. 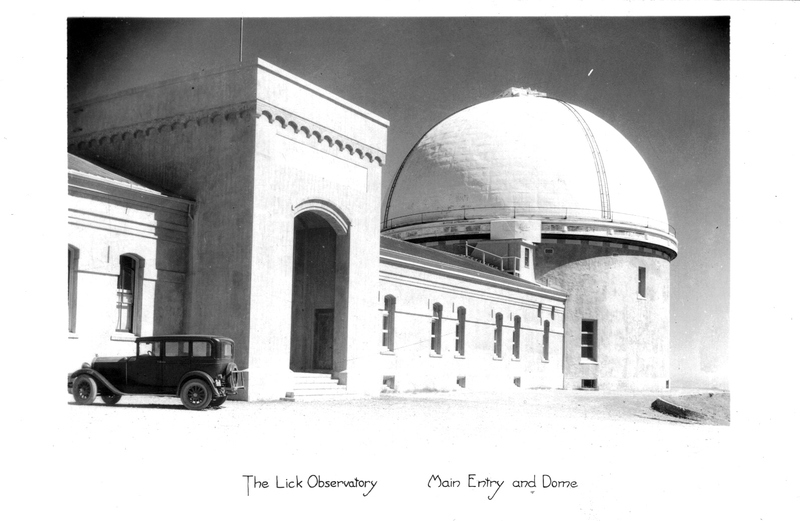 There are at least ten domes at Lick Observatory and new instruments are being added or adapted on a regular basis. I think if the University of California is depending on public dollars to fund the research at the observatory, it might be good to put more information about current research in visitors’ hands. I enjoyed the slide displays of recent discoveries and accomplishments that lined the halls of the Main Building, but I think it would be more effective to have some of those research goals articulated by the guide during public presentations. Just a side note: if you’re driving up to Lick Observatory from San Jose, be careful. This is a very popular training route for cyclists (in fact, the Amgen Tour of California passed through the day before I went up), so don’t whip around those blind curves—it’s not nice to run over cyclists with your car.